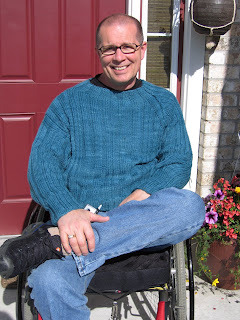 At some point earlier in my life, I started calling my dad "The Dud." It stuck. 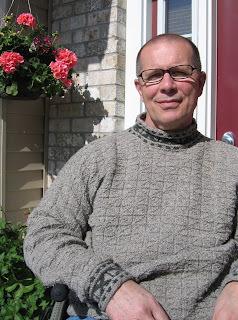 In lieu of any progress I can show you at the moment, here's a look back at two sweaters I made for my Dud last year. 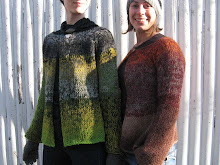 First up, Baltic from Alice Starmore's Fishermen's Sweaters. I used 12 skeins of worsted merino from Greenwood Hill Farm, which is one of the best yarns I have ever used for anything... so soft and yet so durable... why weren't you at New Hampshire Sheep and Wool, O Greenwood Hill Farm?... plus less than half a skein of Malabrigo in an unknown, dark-green-and-black colorway. 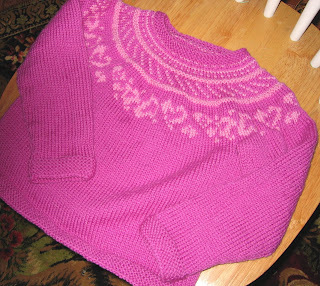 I omitted the bottom border (the "hard" or "fun" part, depending on how you feel about stranded knitting), but other than that knit to pattern to produce a 45-inch chest sweater. This was meant as a Christmas present for 2005, but was actually compl eted in February of 2006. I vastly overestimated my own speed and began it about 2 weeks before the holiday. Shockingly, I made it through most of the body on time, but the arms just killed me. 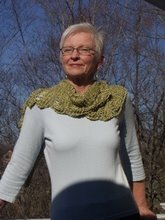 Next is the Irregular Rib Raglan from Teva Durham's Loop de Loop. I used 6 skeins of Lorna's Laces Shepherd Worsted in the "Fir" colorway that I got on sale at Little Knits (but which is absolutely worth full price if you can afford it, you know what I mean, those of you who have used it), which knit exactly to gauge, but stretched lengthwise significantly during blocking. 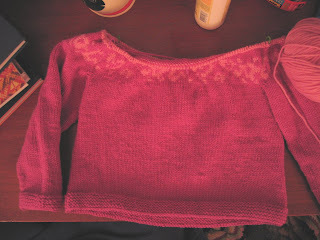 I had to shorten the body and sleeves in the days between Christmas and New Year's. 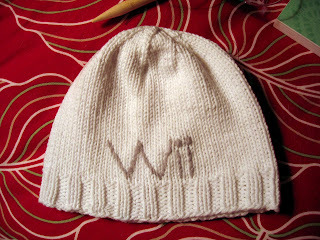 However, this one WAS finished on time... Christmas 2006! This pattern, I must say, is more difficult than it initially appeared to me. 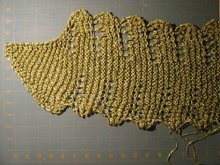 In order to join the sleeves and knit the neck, it was necessary for me to rip and tinker several times so as to line up the ribs as best I could. Oh, and I omitted the toggle. The Dud is not a toggle guy. The Dud wears these all the time, particularly Baltic. I have another sweater planned for him this fall. 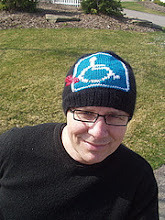 In the wheelchair, he gets cold much more easily than before, so I take it as my duty to keep him both warm and stylish. I could go on and on about how fantastic he is, but you can check out my earlier posts for that. For now, I'm crocheting something purple, a test crochet project! I LOVE it and it's almost done... I'm going to contact its creator to see if I can show some pictures here, hopefully soon with a link to her pattern! Isn't the sunset coming into the plane we took to Michigan this weekend lovely? The latest finished object, a commission from my sister. It will be a birthday present for one of her friends. Do I own a Wii? Nope. Do I know what one does? Well, a little more than before, after looking at the Wii homepage to get a sense of the logo's form. What's important is that I have created a meaningful present for both giver and receiver. Shots of the recipient will be coming at the end of June, for now, here's me wearing it, after it has been washed in the machine and dried in the dryer (low heat). It's made of less than 1 ball of white Lion Cotton Ease, with some Knitpicks Wool of the Andes Fog embroidery, which felted a bit when washed and looks great that way. Oh, and another thing. 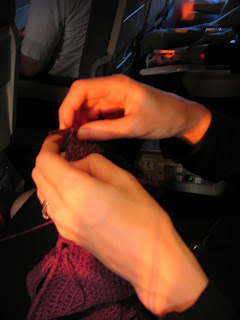 Sometimes those of us who have been knitting for a while and have done a lot and generally seem to have the basics of the thing down, well, we have total disasters, too. Disasters that could have been prevented with just a little bit of planning. Like washing and drying a gauge swatch, something I really always do, except this time. 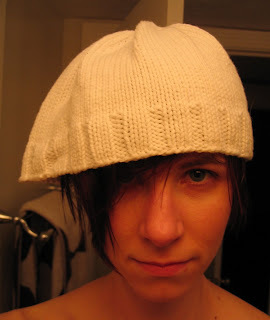 I made a hat that fit slightly loosely, but fit. Then I washed it. And dried it. Just like its owner will. Wash and dry your gauge swatch. Gauge knows when you're getting a little too complacent and maybe a little big for your boots. It will find you, and when it does, it will be as ridiculous as what you see here. See how restrained I was? That's all I got! We will be going to the Maine Fiber Frolic, so this trip was about visiting vendors that would not be in Maine. You know who you are, Grafton Fibers. Those batts in my left arm, yeah, those are Grafton Fibers. Even a novice spinner like myself can easily make a smooth, even yarn out of batts this sweet. I'll give details about the rest in the next post, as I start working with some of the fibers. Chris and I parked about 11 miles from the Hopkinton Fairgrounds and rode our bikes along back roads through the Merrimack Valley to and from the Festival. However, I got us lost, and we rode far, far more miles on the way there. Part of this extra loop (yay fitness, right?) took us seriously offroad. Chris posed me on the trail for this "pack mule" photo. 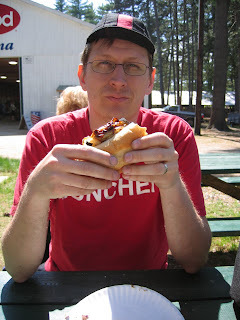 Once there, we had buffalo cheesesteaks, and Chris was happy... we were happy. (By the way, buffalo is DELICIOUS, and we got to meet the farm owners, who were lovely people with a beautiful daughter who was helping to man their small stand. We're planning to go visit the farm!) Being active outdoors, enjoying delicious food, shopping for fiber, speaking with and watching the fiber experts... these are all things we love. And the ride b ack to the car was only 11 miles. 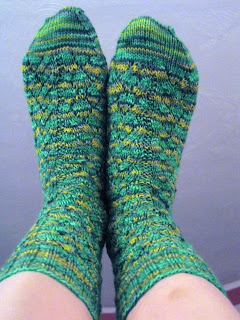 Here they are, in all their glory: Above we have Grandma's socks, from RPM (free pattern at knitty), made on size 2 needles from 2 skeins of Spunky Eclectic Chubby Sock in the color "Joshua Tree." There's a little more green in the colorway, but it was difficult to photograph indoors. Get yourself some Spunky Eclectic; the colors range from the subdued (like this one) to the electric. The socks on the right went to Mom Bergh, my mom-in-law. 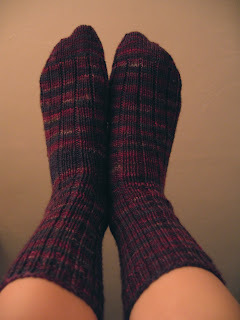 They are your basic 3 by 1 rib with 1 by 1 rib cuff on size 2 needles, m ade from one skein of Cherry Tree Hill Supersock DK in an Earth potluck colorway (the fuschia you see in there broke up the other "earthy" colors and made these quite striking). I got the yarn at Yarns in the Farms, where they had a LOT of colors of this new sock yarn. Finally, on the lower left are Mom Weaver's socks. 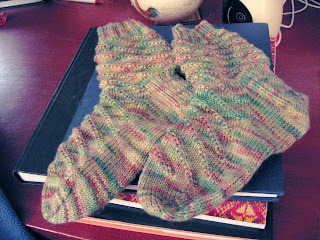 Made from a now-defunct free pattern called "Yukon Leaves," these were done on size 1 needles from one skein of Socks that Rock lightweight in Emerald Isle, purchased from The Fold. Everyone was happy. I am happy. So many lovely sock yarns and sock patterns out there... though this sock tour was a bit more deadline-focused than I would have liked, I loved all the patterns and yarns I used. So now I can go get some more. SNP: Put a fork in it! It's the Sarah's Nieces' Pullover (SNP)! Actually one of two (thank you, Hannah, for making the other one, which I hear is finished) for a set of 4-year-old twins, this is one of my own designs, made from Rowan Pure Wool DK. It's not yet blocked, since I'm waiting to get Hannah's (god bless her, I was emailing her bits of the pattern as I went along) so I can block our slightly-different knitting tensions into one identical size. Pure Wool DK: A little splitty while knitting, but washes up very nicely in the machine. Soft, too! It's also available in a large range of colors, the majority of which are far less garish... wait, let's put a positive spin on that... "immediately attractive to children" than these. 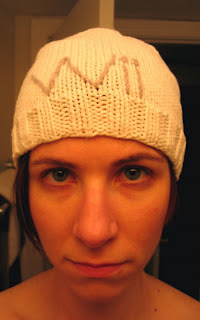 On a side note, does anyone think it's a little weird that Vicky Howell's picture is on the ballbands of her yarns? My server was down all weekend, so no pictures of the 3 mother's day pair of socks yet, but they were all finished on time and the day was a great success! 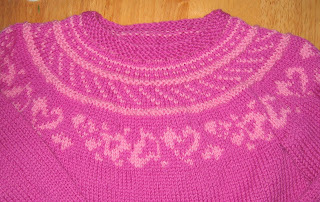 The Sara's Nieces' Pullovers are also completed. Stick a fork in it! It's DONE!!! Tonight? I teach knitting and photograph a large bag of new yarn. For now, check out the link here. Look at the other comics as well! And lots of other T-shirts! 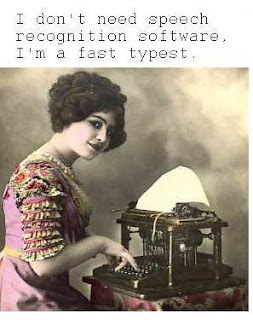 And comics to make your jobjob day just fly by! Look! Knitting! I'm making a sweater for my friend Sara's niece. So actually there are two nieces, they're 5, and they're twins. This is one sweater; my friend Hannah is knitting the other. The design is my own, and will be available at some point if I like it enough. Detail shots to come when I have daylight... these colors (Rowan Pure Wool DK in Hyacinth and Pale Petal) photograph terribly indoors. Two FINISHED OBJECTS from the weekend are in a box that will, tomorrow morning, be headed to Michigan. A large finished object "reveal" will take place on Sunday. While The Chris works 15-hour days to finish The Big House in Weston (Chris does high-end interior painting and is currently supervising the painting aspect of a new McMansion west of Boston) and I am awash in Mother's Day surprise knitting, commission knitting, and upcoming patterns (including one for the June issue of MagKnits, so stay tuned!) and my Job-job becomes a larger pile of paper every day, well, I find amusement in the small things. To purchase the paper book and ebook for $30, click here. Interested in carrying my book in your store? 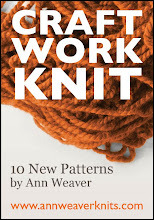 Send me a message at ann@annweaverknits.com! you can hardly believe it's made of Cotton Ease! The LAUREN JACKET: Be Fabulous! Click Here for Free Pattern! 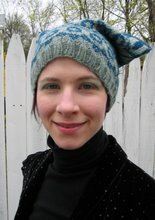 Reptilian is now a free pattern on Ravelry! 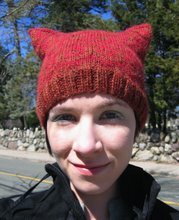 You can find the free PDF for the WHEELS OF FURY hat at Missability and Stitchlinks! Finished in 2007: for more, see my photostream!